Stanley McChrysral is a retired United States Army Four-Star General. He is the former commander of U.S. and international forces in Afghanistan and the former leader of Joint Special Operations Command (JSOC), which oversees the military’s most sensitive forces. His leadership of JSOC is credited with the 2003 capture of Saddam Hussein and the 2006 location and killing of Abu Musab al-Zarqawi, the leader of al-Qaeda in Iraq. 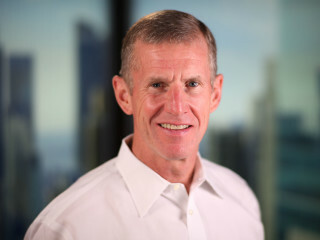 In his new book, Team of Teams: New Rules of Engagement for a Complex World, McChrystal and his colleagues show how the challenges they faced in Iraq can be relevant to countless businesses, nonprofits, and other organizations. This book will be available for sale and signing at the event for $25 per book. If you would like to purchase it in advance at a discounted rate, as well as avoid long lines, please select Member+book or Non-member+book option. Advance registration is appreciated. Please note, onsite registration will be $15 for members and $30 for non-members. $10 for WACH members; $20 for non-members; $30 for WACH members with book; $45 for non-members with book.